Live life at a full gallop in these supercool sporty casuals from Belvedere. Smooth calf and combination genuine ostrich leather upper in a sporty casual oxford style, with a slightly rounded toe, contrast stitching and overlay accents. 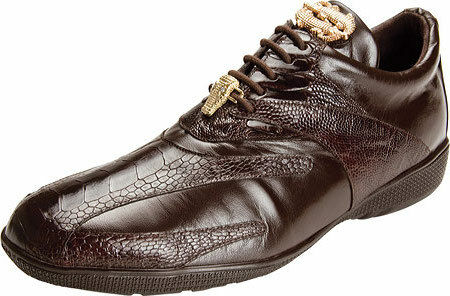 Full lace up front, padded collar and tongue, leather lining, cushioned comfort insole. Low profile sporty midsole, flexible traction patterned outsole with wraparound side and heel panels.